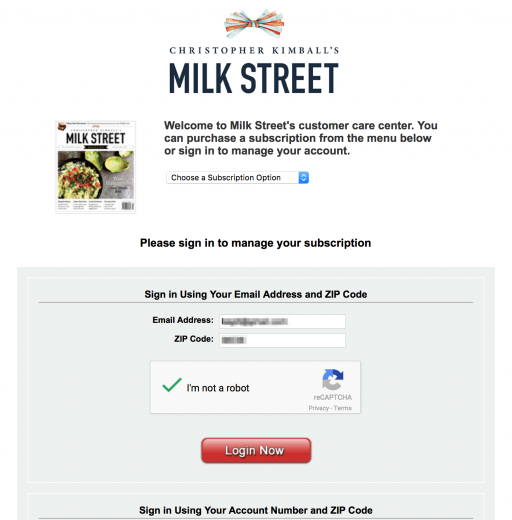 Neither the subscribe insert at the front of the magazine nor on the signup link provided alternative subscription plans. 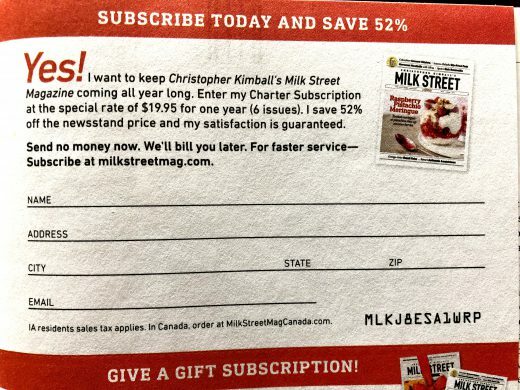 By the time I got to the back of the magazine, a few days later, I discovered a digital-only subscription card. 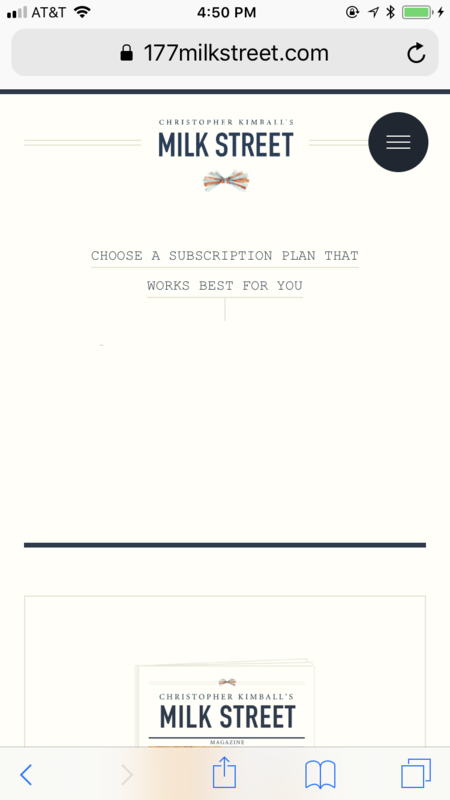 Therefore, only after subscribing did I learn that there was a digital plan and, through exploring, an as-yet unadvertised to me combo print/digital plan. I tried to upgrade online, but Milk Street wanted the subscription number that’s printed above the mailing address. So I resigned myself to waiting until the first magazine arrived in the mail. That happened this week. 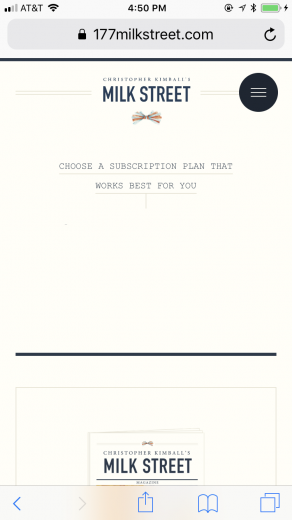 Notice there there are no options to modify the subscription, and there is conflicting information regarding payment. 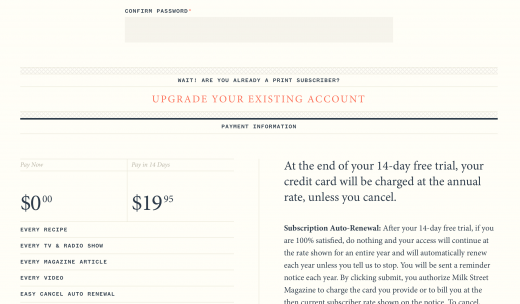 First, there is no option to change the subscription type in the left-hand navigation options. Second, I see conflicting information regarding payment. “Account status” says I haven’t paid anything (which matches my memory). 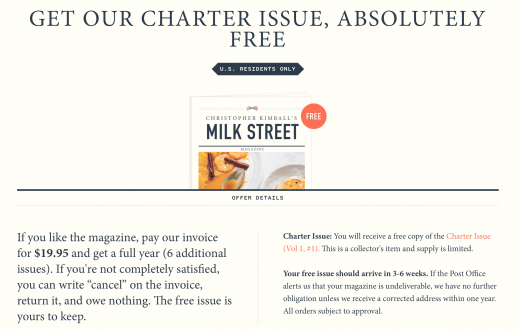 My goal: change to a digital+print subscription. However, there was (still) no chance of doing that here, so this was a repeat of my March attempt. At this point, I went back to the main magazine website and clicked “get digital access” because I didn’t remember exactly what I did back in March. There was still no information about a dual subscription service, just a lot of marketing copy about the features of a digital subscription. 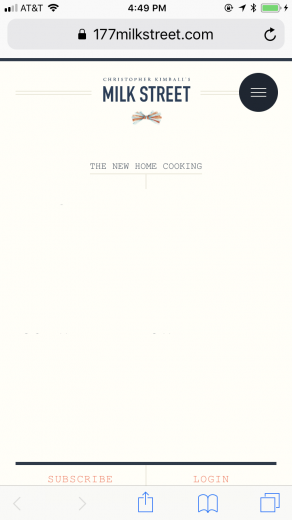 And a BIG advertisement for a cookbook. An observation about LOTS OF ALL CAPS CONTENT: it’s hard to read. I normally ignore it (so I can’t explain how I saw it this time). All caps is not part of the magazine style guide. 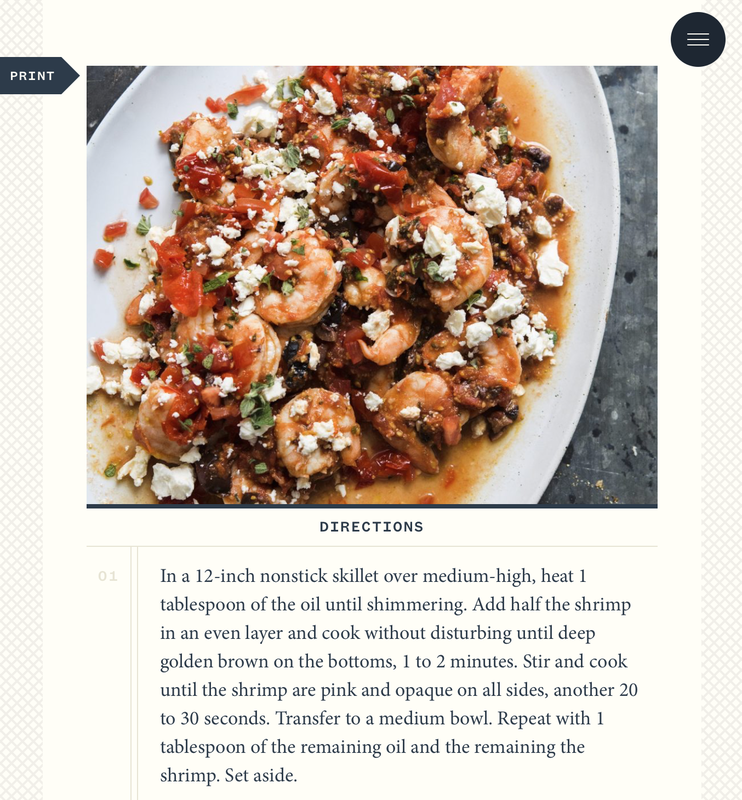 Not only is the all caps link text hard to read, its type size is such that the copy does not stand out visually compared to the lead-in copy to the digital subscription. 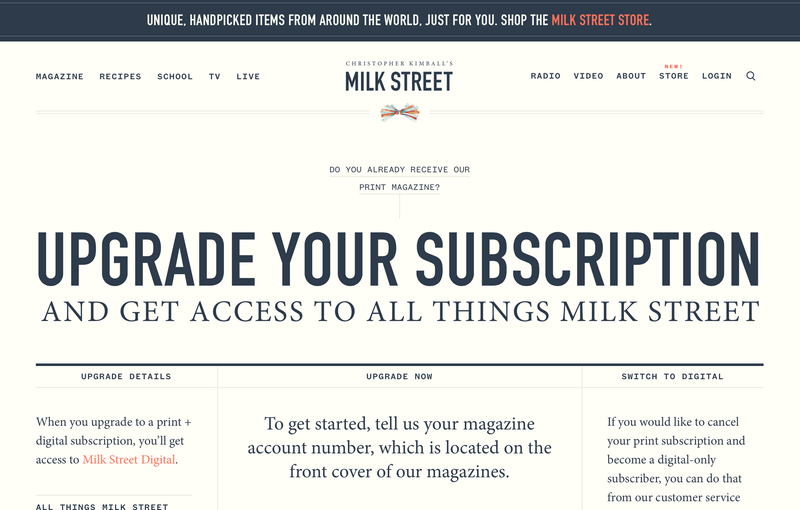 Milk Street has located my subscription but says I’m not logged in. I logged in ages ago, at the beginning of this process. But that, I’d forgotten, was a different website. 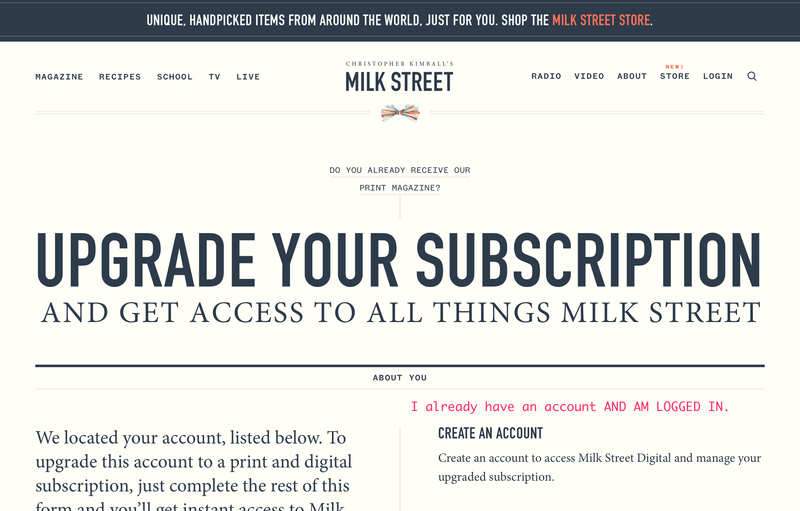 In my mind, I’m logged in, so I don’t understand why Milk Street is insisting that I’m not. Then I remember: there’s a domain name mismatch. I am logged in at milkstreetmag.com which redirects to w1.buysub.com. I’m not logged in at www.177milkstreet.com. And guess what? 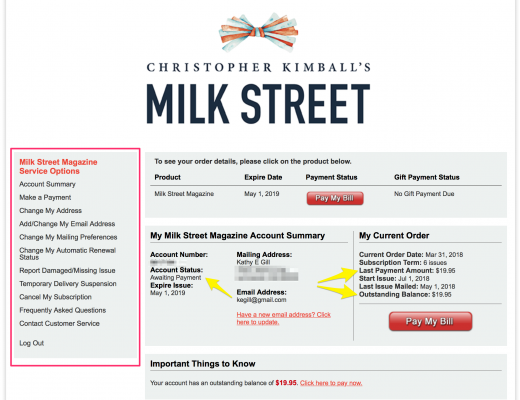 Those credentials didn’t work at the Milk Street website, because the billing lookup uses only your email address and zip code. 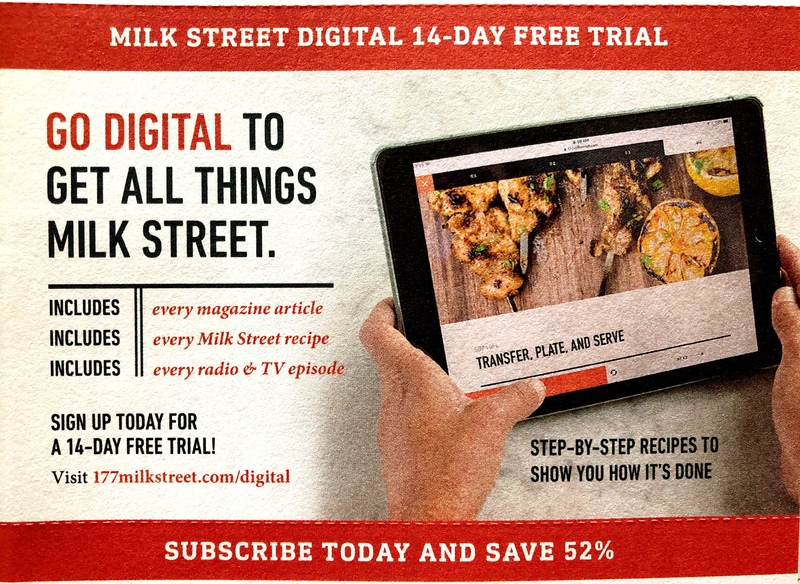 At some point, while I was writing this, I saw the “Learn more” link at the top of the digital subscription page. “Looking for a different plan” is not a link, underlined though it is. These small type, ALL CAP call outs will be missed in a skim. They’re even more likely to be skipped while swiping in digital. Channelling Edward Tufte at this point, I’m appalled at how little content there is above the fold on the subscription page (or any page on the site). I’m working on a 15″ MacBookPro, with screen resolution of 2880-by-1800. Scrolling a half-screen on the MBP reveals the comparison. This is, however, an even more painful experience in mobile. Look at that huge blank space on the screen. It’s more obvious on the home page screen. Comparison subscription screen, iPhone 8s. 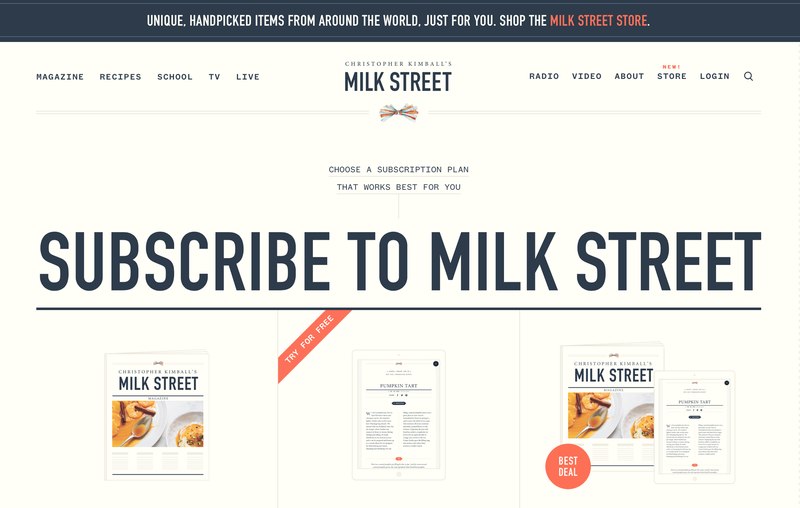 This is the Milk Street Magazine home page on my iPhone 8s. 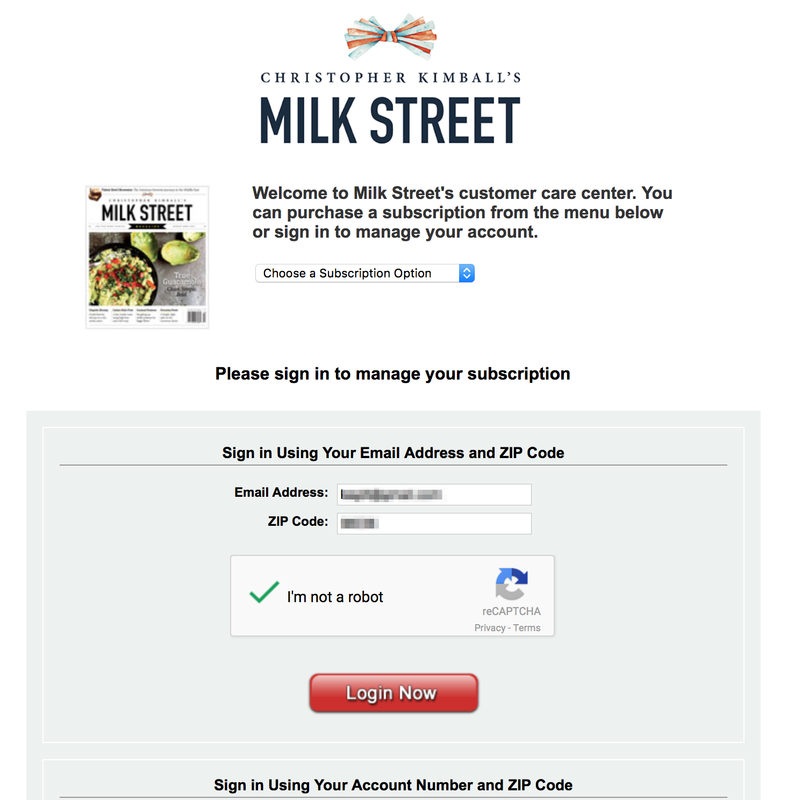 When I clicked the “upgrade” option, the Milk Street billing system said it would add a year’s print subscription and digital subscription to my account. That was not what I wanted: I didn’t want two years of print and one year of digital, which is how I interpreted the summary. 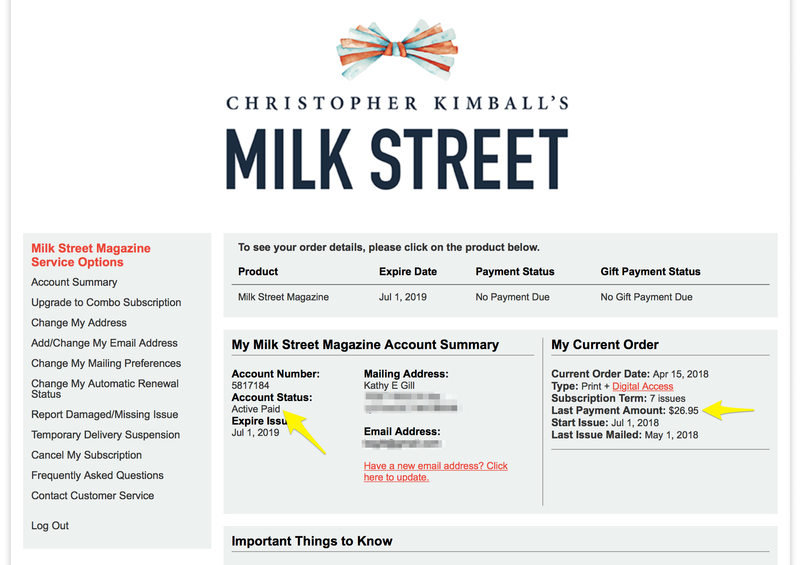 While searching for the password reset, I saw all the mail that I have received from Milk Street since I placed the order and set up the account on March 10. I found a promotion for upgrading to digital+print. Even though it was ancient (a St. Paddy’s day promotion), I clicked the email link and it worked! So I gave the system a CC number and subscribed to the combo. I fully expected to have two subscriptions at this point but was amazed to find that this did, indeed, add digital to the existing subscription; using the same email address must have been the trick. “Last payment amount” is now an accurate indicator. I have no idea how this action boosted my subscription to seven issues from of six, since I had not paid for the first one. 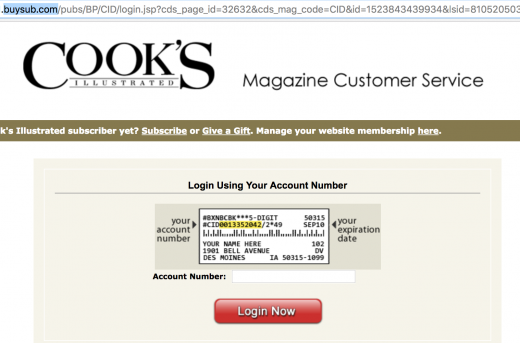 Based on my experience, the only people who can set up an account on the magazine website seem to be those who have a digital subscription. If this is indeed the case, that language needs to be added. Prominently. 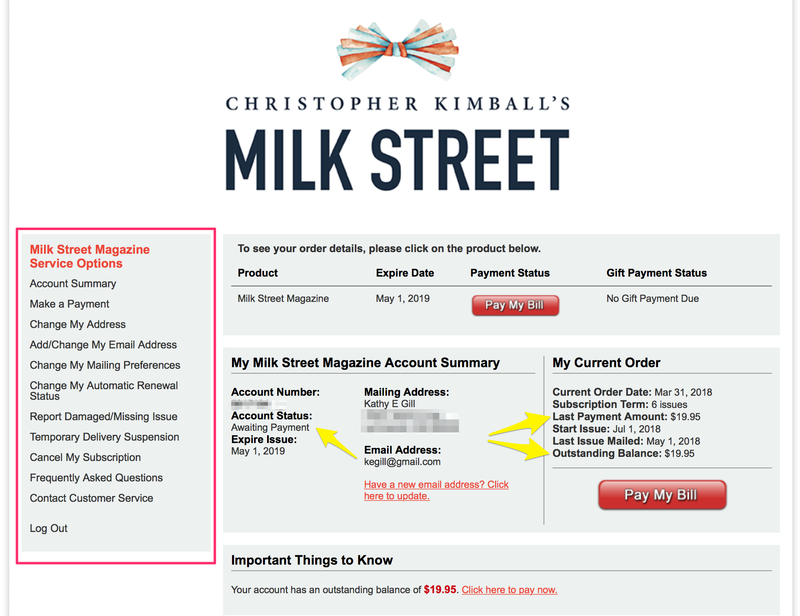 Milk Street has an online print-only promotion where subscribers can get a copy of the initial issue of the magazine. 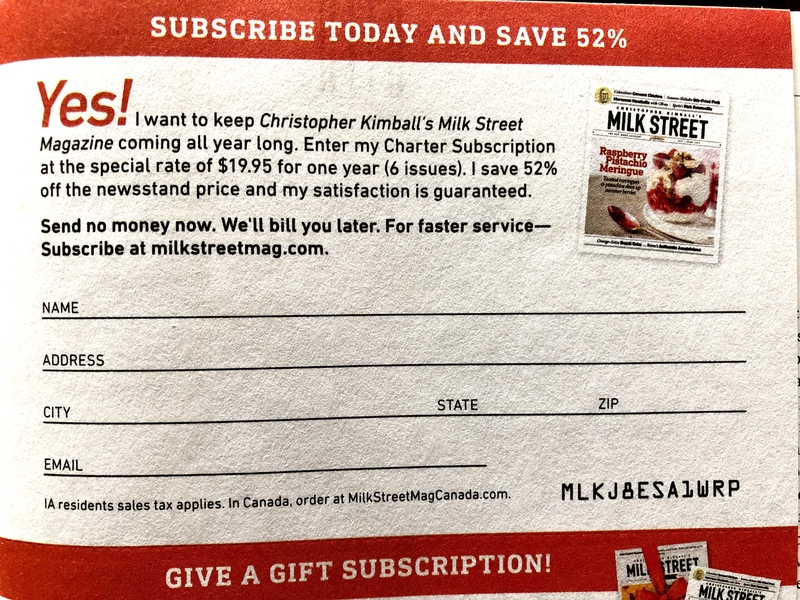 This promotion seems to be limited to (a) people who stumble onto it online, as it’s not in my current print issue or the newsstand issue I bought earlier this year and (b) people who subscribe only to print (which was me, initially). It’s experiences like these that cause me to want to strangle marketing people. There are too many disparate options; unified messaging is lost in space. And then there’s the less-than-seamless integration with a third party billing service. 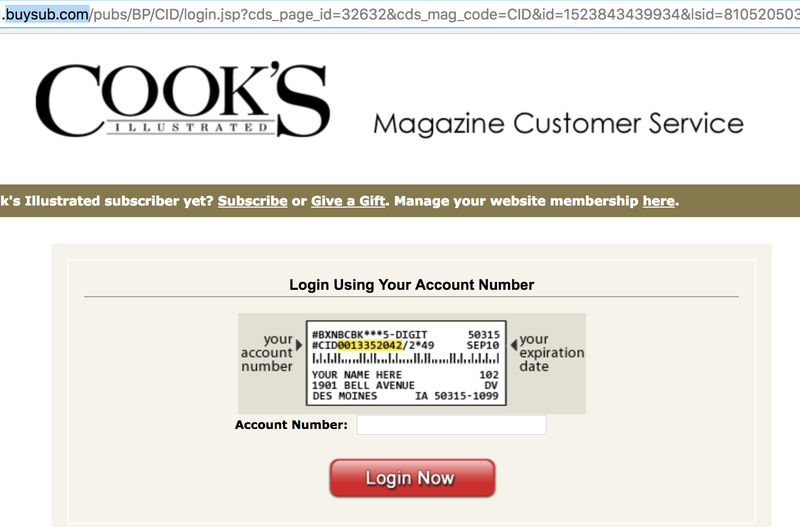 Using a third party for billing is not unusual, and this is the same one used by Cooks Illustrated. However, the system needs to be integrated into the main site in a way that makes sense to customers. Our customary user experience is logging into the content site and seeing everything about our account. We are not accustomed to two different “account” systems. Milk Street uses the same third party tool for managing subscriptions as Cooks Illustrated. 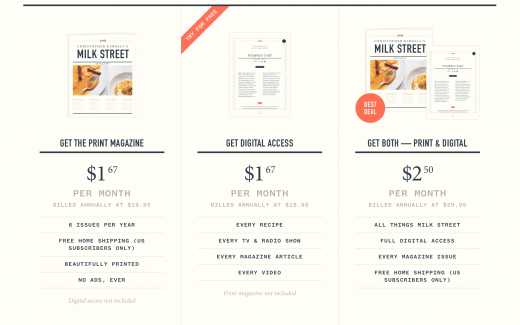 The marketing team should use one landing page for online subscriptions, not two different ones. 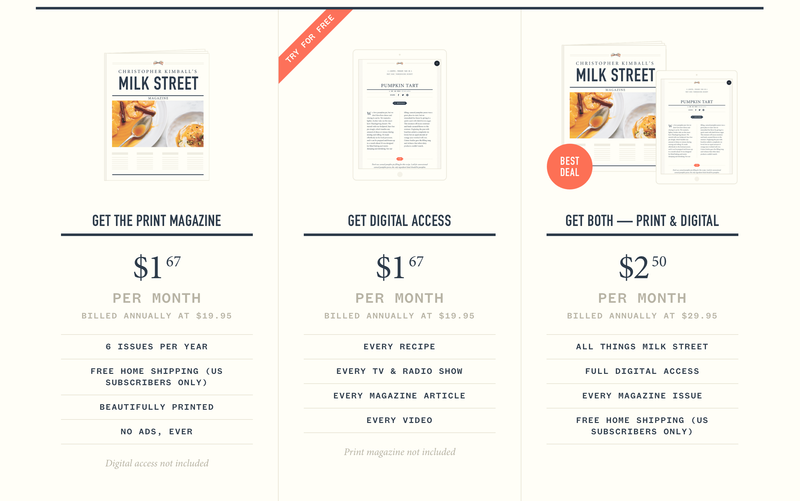 That landing page should provide easy access to all subscription options. Turning the bonuses for subscribing (a free copy of the initial issue) into a website scavenger hunt is counterproductive: it turns those of us who came directly from buying the print magazine (we just paid full price!) into second-class citizens, which builds a tiny vein of resentment. 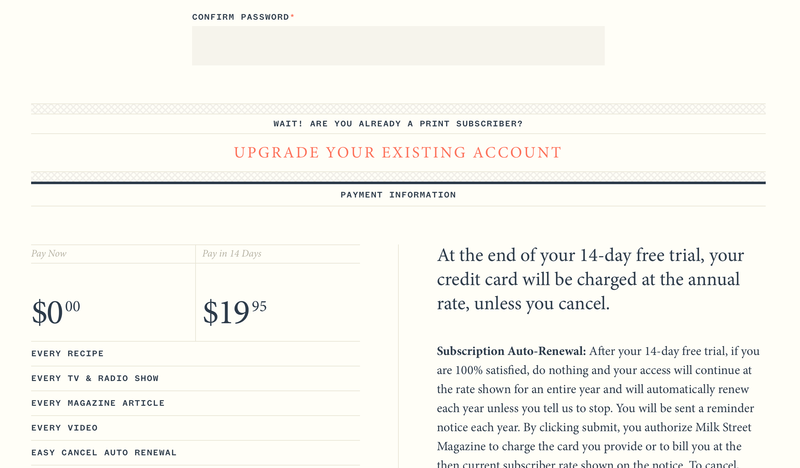 In a later post, I’ll suggest redesigns and a different subscription flow. I’m very excited about the recipes, though! 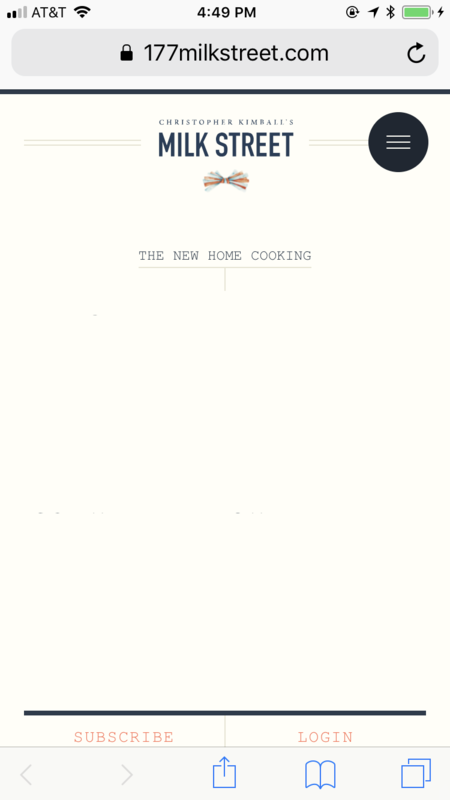 I’ve been a subscriber to Cook’s Illustrated for longer than I can remember; the magazine (and America’s Test Kitchen) was the brainchild of Christopher Kimball. In 2015, the parent company announced Kimball would be leaving the company he founded. 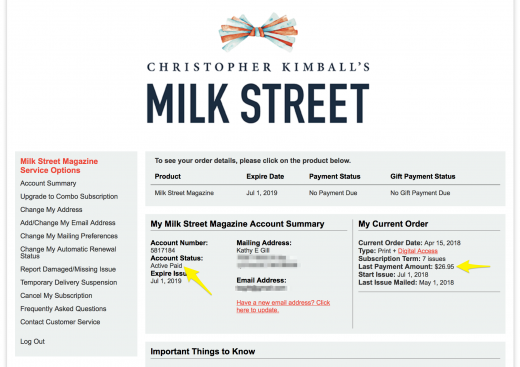 Instead of polishing his carefully created New England sensibility and hovering over the obsessive recipe-testing platform on which he built Cook’s Illustrated magazine and its offspring, Mr. Kimball is loosening his bow tie and shifting his culinary worldview. 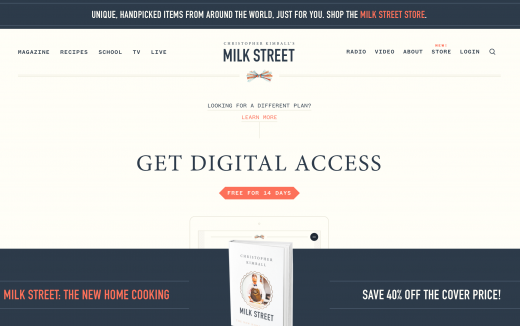 His new project is called Milk Street Kitchen. With $6 million from investors and more at the ready, Mr. Kimball is remodeling the ground floor of the Flour & Grain Exchange building on Milk Street in the financial district here in Boston. In the fall, he plans to publish a new magazine, shoot a public television series and begin writing books. He’ll start a cooking school, and promote the whole enterprise at a dozen live road shows. He is even designing a chef’s knife to sell. Kimball is tenacious: he launched Cook’s Magazine in 1980, then sold it to Condé Nast Publications. When they shuttered the magazine, “he bought back the title for $175 and reintroduced it as Cook’s Illustrated in 1993.” One of the hallmarks of both magazines: no ads.